"I'm 42-years-old, but feel like I'm 62." "I have lost my glow." "I miss the woman I used to be." "I'm so afraid of getting older." "I want to feel healthy and alive again"
If you've had these or similar thoughts, you're not alone. Robin McGraw, wife of television talk show host Dr. Phil McGraw, receives thousands of emails from women asking her what she does to look and feel so vibrant, energetic and healthy at the age of 55. It all started back in Robin's twenties and thirties when pivotal moments in her life made her realize that if she did not put her health and well-being first, no one else would. One such moment came in her early thirties when Robin experienced the sudden death of her mother, a wonderful woman who put the needs of her family above her own and, as a result, didn't know that her health was ailing. This tragedy made Robin realize that in order to be the best wife, mother and woman possible, she had to take care of herself as if her life depended on it. In What's Age Got To Do With It, Robin urges you to do the same and shows you that it's not selfish to take care of yourself. Robin says, "I wrote this book, not only to answer questions about what I do to stay healthy and in shape, but to remind women that it's time to move yourself to the top of your list of priorities. If you can't do it for you, then do it for your family.? Because my precious mother never did that, she missed out on so many wonderful years and experiences. I realized that it doesn't make you a better wife or parent if you're sacrificing everything -including your health, soul and spirit -for your family.? I refuse to perpetuate that legacy and I want you to join me and get excited about living your life in a passionate, happy and healthy way. It's never too early to start taking care of yourself, but it's also never, ever too late." Misprint in book can make you violently ill - No one acknowledges it! Fortunately, I got this book from the library which I often do before investing in a book. I took some notes from reading it and was prepared to buy the book UNTIL I used Robin's "recipe" for a morning drink to jump start your metabolism and energize your day. Since I have returned the book I can't tell you what page the "recipe" is on but it is in a highlighted gray box. She says to mix 1 CUP of Apple Cider Vinegar, 1 CUP of warm water and 1-2 Tablespoons of concentrated lemon juice. I managed to drink it down but OH MY GOD! It burned in my throat, it burned in my esophagus and it burned in my stomach for hours. I lost count of how many Tums and antacids I used that day. Several days later, determined to better my health and appearance, I thought "OK - I'll start out in smaller proportions and build up to her recommendation." This time I mixed 1/2 cup Apple Cider Vinegar and 1-1/2 cups warms water and just 2-3 drops (not Tablespoons) of lemon juice. This time I gagged it down. OH MY GOD again - It burned just as badly and within minutes I vomited it up so it could burn my stomach, esophagus and throat a second time on the way back up. From that moment on I thought - NO WAY! I don't believe for a second that Robin drinks this. I went to the Dr. Phil website and e-mailed the situation to Robin under the link "Ask Robin a Question." No response from anyone. Not Robin, not a staff member, no one. One would think they could be courteous enough to say, "Yup, there was a typo that the publisher missed and we are so sorry that this happened to you." One would also think that there should be a published notice on the web from Robin and/or the publisher acknowledging this typo/misprint. Snooping around the web, I found others who posted this drink as 1-2 TABLESPOONS (NOT 1/2 CUP) of the vinegar to 1 cup of water. Huge difference. I just wonder if there is this typo, what else is wrong in the book. Why can't someone have the decency to acknowledge the error? With the wrong medical condition, this typo could cause internal bleeding in some people. I admire Dr. Phil's work and Robin's as well, but there is some "righting of the wrong" that needs to be done in regards to this book. Hi girlfriends! I read a new book this past week and wanted to share it with you. What's AGE Got to Do With It, by Robin McGraw (better known as Dr. Phil's wife), is a great read for any woman of any age. At the age of 55, Robin wants to share a few things she's learned about accepting her age and being the best she can be. Robin Includes 9 Chapters in this friendly-read, including What's AGE, FITNESS, NUTRITION, SKIN CARE, HORMONES, HAIR, MAKEUP, FASHION, AND FAITH got to do with it? To be honest, my initial reaction to the title of this book was that I'm only 37 and this may not be a good fit for me and the current issues I'm facing as a woman. However, I was quickly drawn into the sincerity of her words that became a source of motivation for me to be my personal best at any age. I believe that this book is extremely appropriate for even younger women as well, since it gives incredible assistance in areas that all women deal with on a regular basis. In addition, it will help a younger woman prepare for what is to come one day soon. If we take care of ourselves and build good habits now, our "aging" process will be much easier to handle and more enjoyable for ourselves and those around us! This book touches on a few areas that may seem frivolous in the real scheme of life. Robin consults with experts in the areas of skin care, make-up and fashion, as well as her own personal experiences and preferences in these areas. She takes time however, to show us how our outside self can be a reflection of our inside spirit. True beauty starts from within and if your inner-soul isn't at peace, your outside can reflect that. Further, small changes in these areas of our lives can help bolster our confidence as a women. I was expecting a book about Hormone therapy. This book has some of that, but not enough. I do not need more How to exercise, how to dress, or how to do my make up. The hormone therapy is totally expensive and the clinics and doctors are beyond my reach financially. This is a book about her attitude towards life. She conveys the great importance of self-love for women. Women should never feel the need to surrender their desire for health or beauty. With the right tools, women can live a healthy and happy life at any stage of life. And those tools or her researches happen to be the byproduct of the book. She is very clear that she is not a physician or professional health expert. She talks about herself, her problems and what she found to be the most useful for hself as a way to share with the other women how she becomes a really healthy woman and individual. She also provides inexpensive and affordable options for workout or regular maintenance as a woman who used to be in the middle class. I admire her passion in sharing. I also admire her confidence shown in her language and all the hardwork in researching so much information just to help some women to love themselves better. My mother is one of those women who needs this book because she doesn't really know how to love herself before her family. And that doesn't make us children feel more secure or better. Just like the rest of us who are not doctors, she desires living her best life for herself and her family. The difference is she might have more access to the experts than most of us because of whom she married to. If it weren't for her passion to share, she really didn't have to do this. So, kudos to her. If you are looking to read FROM a professional doctor for advice or new information, then this is not the book. If you are looking to learn from another regular woman who is not weak and is confident, then this is it. She is candid, passionate, confident, and aggressive as a smart woman who wants to live her best life. I know that many women who want to be a good mother, a good wife and a good woman could benefit from this book. I got this book some months ago and just found it really hard to get into. Primarily because I've never had a hang up about age. When you race in triathlons and you're routinely beat by 68 year old women in the run, you know age has NOTHING to do with "it". So I don't think I'm the intended market for this book - not because I'm not 55, but because I've always been aware of the importance of leading a balanced life, mentally, emotionally, physically and spiritually. I may not succeed, but I do try. Robin McGraw's book is well intended and has some basic common sense advice. The chapter about skin care is one I should pay attention to being out and about in the sun as much as I am, and I've been making more of an effort to take care of my skin and put sun block. I guess there's just nothing new or earth shattering in this book. It doesn't mean it's not a good book. It's well written and many of the anecdotes are in a "between girlfriends" conversational style that is intended to make the reader feel involved. No matter your personal opinion of Robin McGraw, this book contains a wealth of helpful information for all women. If you want to live your life fully and head into middle-age and beyond with health and grace, this book is for you. Robin has thoroughly researched her book and provides specific recommendations, including brand names, dosages and care regimens. Everyone should make their own informed choices regarding their health and the way they live their lives, and "What's Age Got to Do With It?" can be a helpful resource. My main criticism is that many of the products or treatments recommended are costly, and out of reach for the average American woman. Some reviewers said they were disappointed this book was about Robin, but it is her personal journey to health, wellness and happiness. I had recently seen Robin McGraw on Oprah talking about her new book when I decided to order it and give it a spin. I like that she is both a gutsy, take charge kind of gal who is an advocate for herself and is also not afraid to be a girly-girl either. The books have chapters that cover menopause, beauty, health, nutrition, fashion, etc.....pretty much everything on what she does to make herself feel the best that she can be. We can't choose whether we will age or not...I mean what is the alternative? Die young instead and be a pretty corpse? No thanks, I think I'll just try to age as gracefully as I can and not worry too much about it. Each chapter has little boxes within the chapter with Robin's Rx-something she has discovered that worked for her that others might find helpful and then at the end Q&A with experts in the chosen fields for that chapter. She has a lot of good common sense ideas and yes, you probably have heard many of them before, but I bet you are still buying beauty and fashion magazines that have basically given you the same advise for years. Why? Because the advise works and apparently we need a little reminding....(ahem, did you put on your sunscreen today and take that multi-vitamin?). One thing I liked, that if you get nothing else from the book, is you need to make yourself a priority....if you are consistently caring for husbands, children, everyone else but you and hammering yourself into the ground you really aren't doing anyone a favor. The people who love you want you around for a LONG time, so do them a favor and take care of yourself....eat nutritiously, get some exercise, and take a little down-time. This doesn't make you a bad person....it makes you a smart one, who is more able to cope with the day's challenges. In her "just chatting with a girlfriend" style, she makes it a good read filled with little tips and reminders so that you can be the best "you" you can be. If you like Robin's style (and I do) you will probably find at least a few nuggets of wisdom to take from the book and incorporate in your life. In Robin McGraw's latest, What's Age Got to Do With It, she encourages the reader--who she most likely expects to be a woman in the throes of middle age--to do more than stop and smell the roses. She expects them to wear make-up, take time for themselves, care about fashion and fitness. Because after all as the cover photo clearly demonstrates, this approach has worked for her and at fifty-five she looks fantastic. The book's sub-title, Living Your Happiest & Healthiest Life, is an ambitious proposition for any book-- to say the least--and unfortunately one she and the publisher should have avoided with this one. The book is not ambitious and it is doubtful that anyone will be living their happiest and healthiest life simply by following Robin's advice. "What's Age Got to Do With It? ", is largely a re-hash of many common sense advice columns written over the past decade. Eat right--check, exercise regularly--check, understand that your body changes as you age--check. Get the picture. In other words, this book really is nothing new or earth shattering. Of course, most self-help books cover the same ground time and time again. There is nothing wrong with this approach since most people buy self-help tips from people they can relate to in some way, shape or form. I ordered this having no clue who Robin was, but wanting good information about how to get in shape and be healthier now that I reached my 50's and am sick and tired of being out of shape, and tired. Which seemed to be who the book was aimed at. Alas, she is terribly repetitious in the first chapter about how she started exercising regularly in her 20's and how much it has paid off now. Well, what about those of us who were too busy building a career, then having kids (much later than 20's), etc. who spent decades running themselves ragged and eating junk food because we could eat it while zooming somewhere? I have always hated exercise, perhaps due to asthma, but this book did not inspire me to want to exercise, instead it made me more depressed that I did not start it seriously and stick with it decades ago...women SHOULD read this in their 20's of course, but how many women in their 20's really think they will ever age and try to prepare to age gracefully starting at that age? Robin repeated that her mom died of a sudden heart attack so often I wonder if she read back what she wrote? I was really interested in the Nutrition section, but there was very little there except very basic information. Now I know that Robin is allergic to dairy and peanut butter though. I wanted to know about which of the vitamins and nutritional supplements would be helpful in particular, there are so many of them available. I am stunned that she eats steak and suggests it in her menus, since I have read and experienced for myself the harm it can cause you. She states that if she cleaned up her diet she could drop 10 pounds more, but she does not feel like it is worth giving up the things she loves....um, isn't that the attitude that causes most of us to be overweight? Then we move on to skin care- glad she does not recommend plastic surgery. The hormone section was interesting to me, since I have not bothered to read much about them before. The hair, makeup, and fashion sections though I was disappointed in. I wish we could encourage each other to have our hair natural, not dyed, and to not wear much makeup. I have never worn much makeup, and never understood why we feel like we have to spend such incredible amounts of money (and time) so that we can present a 'beautiful' face. Men do not seem to feel the need to look perfect for us after all...I was so hoping for some greener tips. Review of Robin McGraw's "What's Age Got To Do With It: Living Your Happiest & Healthiest Life." I ordered this book for my wife who fits the demographic Mcgraw intended. In her latest book Robin McGraw provides tips on everything important to a woman's health and well-being such as: Skincare, exercise, hormone replacement therapy, faith, and nutrition. Robin also advocates the use of regular health screenings for cancers, etc. and provides information on free and low cost procedures as well as deep body scans. Her chapters also include professional advice from experts in exercise physiology, nutrition, etc. Her main purpose in authoring the book is to stress that women must stop putting themselves last if they want to be there for their families in the long run. In short to prioritize their lives and maximize their respective health so as to benefit themselves and/or their families. She uses her own mother as an example of a woman who put herself last and died too young. Although it is easy to stress that Robin has access to time and money to realize her health and beauty goals, her advice has application to every woman of every means who simply desires to be as healthy as she desires. Thank you for reading my review. Michelle. Robin McGraw says that she gets thousands of e-mails and letters asking for her beauty secrets. In this chatty, easy to read book she gives a detailed accounting of her fitness, eating, and beauty regimens, including a chapter on her experiences with menopause. She states many, many times that she is not representing herself as an expert - and that each woman should learn what is right for them. I confess I have never seen the Dr. Phil show and did not know who the author was before reading this book. All of the fitness and nutrition information were things I have heard or read from other sources, and she does contradict herself in several places. However, if fans of the show will listen to her - I say more power to `em! In this wonderful book, bestselling author and mother of two, Robin McGraw gives her advice on how we can be "the healthiest and most energetic and vibrant women we can possibly be." She correctly points out that most women consider time and money spent on themselves as resources not available to those they love, whereas in reality, investing in yourself makes you a better resource for your loved ones. Following up on that, she goes through, and shows what we can do to take better care of ourselves in an efficient and effective way - in terms of nutrition, skin and health care, and so much more. I think that this is a great book - I mean, is it earth shattering advice that you have never heard before? No, it isn't. But, what it is is great advice on being all that you can be. It is the sort of advice that I have been following all of my life, but Robin sets it all out in a thought provoking and truly informative way. If you do want to live your happiest and healthiest life, then get this book, and follow its advice! This is the longest I've taken to do a book review in my life. I've had Robin McGraw's book What's Age Got to Do With It since January. I will readily admit I was looking forward to reading this book by the lovely and radiant wife of Phillip McGraw, more popularly know as Dr. Phil. I don't watch his show on any kind of regular basis. In the past few years, I have seen parts of it maybe two or three times. However, the couple of times I have tuned in, I have seen Robin McGraw, and I have wanted to know more. She is engaging, beautiful, and seems like someone with whom I would enjoy having a cup of tea. That leads to my reading her book of the above named title. Being a 42-year-old mom of three school-aged children, the book certainly appealed to my inner teenager longing to burst forth . . . regardless of the age on my driver's license. At first I was encouraged and found hope in Ms. McGraw's words. I found her style of writing easy to read and digestible if taken in small, nugget-sized portions. As I progressed through the book, I became more and more bogged down by all the things I could and should be doing in order to be more like Robin. After reading this book, I am disappointed. What I realized part way through it is that this book is really more about Robin, not as much about helping the every day at home mom who is on a tight budget. I guess what was lacking most is that Robin gives us no new information here. What I read throughout this book is a duplication of many of the tips and suggestions I've heard numerous times in a variety of different women's and beauty magazines. The book does wrap up in a tidy fashion with a brief hat tip to Robin's faith and her relationship with Jesus. I personally would have liked for her to elaborate more in this area. However, if you choose to read and share this book, it may be a good way for you to open a discussion with a non-believing friend who is interested in improving her health and living at her best age now. What's Age Got to Do With It did not live up to my expectations, but by the end of the book I did feel motivated to take time for me amidst all the other "mommy" responsibilities filling my plate each day. I guess that is certainly worth the read. REVIEW OF What's Age Got To Do With It? 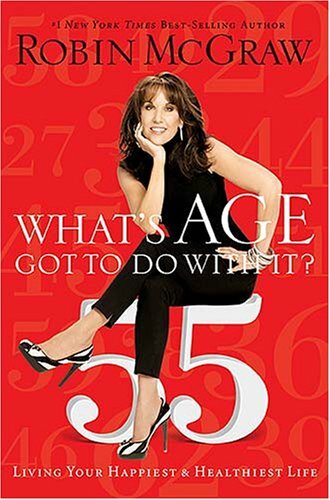 As a woman who is in her mid-forties, I was eager to read Robin McGraw's book, What's Age Got To Do With It? I'm in the stage of life where the bad is increasing and the good is decreasing in regard to my health and body. I thought perhaps this book would give me guidance on how to tackle such issues. I jumped into the book and first noticed it was an easy read. Robin integrates much about her own life in the book. This may not be interesting to some but it usually held my attention. However, the majority of the content was not new knowledge. What was new were the names of many of the beauty and health products she uses. I've never heard of most of them and I'm assuming they're too expensive for me to invest in or justify purchasing with two young kids and in this economy. In the books defense, the section on hormones was very informative. This is new territory to me. Being in the beginning stages of this new battlefield, I'm pretty ignorant in this area and what is out there in the form of symptoms and treatments. Robin did a great job on breaking this information down and educating the reader on different avenues to be taken to bring stability to a hormonal life. I did enjoy the book and it wasn't a drag to read. Even though there wasn't a ton of new information to this girl who's read her share of magazines and articles on health topics, it still inspired me. I'm in a hard phase of life with two young kids and a husband who travels a good bit with work. There's usually little time for "mommy". Robin's book encouraged me to begin taking little steps to improve my health and appearance. I'd recommend this book to someone who's not looking for tons of new knowledge, but mainly guidance and encouragement to begin putting back into their own health and appearance. Maybe money has more to do with it. This self help book is crammed with details about how to stay young looking as long as one has the money to do so. There is some good information on diet, nutrition and excersise but I had to wade through the personal beauty regimen of Robin who obviously can afford the best but the rest of us have to try to make do with what we have. To her credit, Robin includes some good advice about how women should take care of thier own health and not neglect it before it is too late. What's Age Got to do With It? honestly took some time for me to get through. Although it is only 213 pages in 9 Chapters, I found myself trying to decipher between her life versus the advice and long list of experts that backed up her claims. The extra jargon (for me) was distracting; however, I understand if it was required for liability purposes. Personally, I would have much rather read through the advice and personal experiences without all of the "medical-ease" and long list of experts - most of whom - I don't know. I would have preferred it to be at the end where if I had wanted to get more info, it would be there. With that being said and out of the way, I must confess. I love this book!! It is truly chock full of great advice. What's even better... is that this advice is coming from a woman, whom may have it all compared to my or your standards now, but didn't have so much her whole life. Within the chapter, What's Fitness Got to do With It?, Robin shares how in the beginning, she and her husband (Dr. Phil) lived in a small apartment and couldn't afford "a good pair of tennis shoes or sports bra!" The point being that she gets it. She's been there. And it doesn't cost money to get in or stay physically fit and I think some of us forget that thinking that having a gym membership is the only way to get results. Another chapter that I enjoy is, What's Skin Care Got to do With It? I've been struggling with adult acne for some time. I was oblivious to the fact how bad - and it's not as bad as some, so I'm not crying for me - but it really got to me when I saw my wedding photos. When they arrived, instead of being happy and excited to share, I was mortified. Not able to afford a dermatologist, I've tried many over the counter treatments and a popular mail order brand. The only thing that works is the mail order brand, but unfortunately, it bleaches out my clothing along the neckline. I canceled my subscription to the mail order brand some time ago and have been trying to create the right 'homemade' concoction. Some seem to work and others not so much. Now I can use Robin's advice as a guide. Again, chock full of information, personal & expert advice and personal experiences. Take a look at other topics covered. What's Fitness Got to do With It? What's Skin Care Got to do With It? What's Hormones Got to do With It? What's Hair Got to do With It? What's Makeup Got to do With It? What's Fashion Got to do With It? As with any self help material, take what you find useful to you and take action. If you don't take action, nothing will change. With that, I leave you with a quote by Norman Vincent Peale. I was prepared to hate this book. I'm not fond of Dr. Phil. I don't like know-it-all doctors who exploit fragile people for the purpose of television entertainment. And I don't particularly like the idea of wives who exploit their husband's fame for the purpose of elevating their own mediocre talent to the level of best-selling author. But I have to give Robin McGraw credit for giving intelligent advice. It is true that some of us women really do put our family's health before our own. We should spend more time taking better care of our health. In the long run, it is a good investment. And we should also take care of our skin and our hair, and dress in appropriate clothes. Things like that are easy if you are, for example, a rich white lady whose husband stars in his own television show. It's a little harder for those of us with more normal lives. Robin understands that, and she advises us to shop at Target. If you feel that common sense and basic health information that you should have been learning your whole life are not currently in generous supply (welcome to the club), then you should probably read this or a similar book. What does Bioidentical Hormones have to do with it? I am not a Dr. Phil junkie...like him, like her, but I do not spend much time watching television. Read this book while at a conference in Sedona. Robin has such a good way of telling you about things, but not making you feel inadequate because you may not be as active as her, wealthy as her, etc. I learned much about make-up products that have worked for her (very nice to know so I am not making costly mistakes on items). These tips I value because she is on stage with make up done by herself! Good Job! Much like the introductions in an AA meeting, Robin McGraw--wife of the ubiquitous Dr. Phil--is fifty-five and refreshingly honest about it. In her newest book, What's Age Got To Do With It, readers are rewarded with a total body makeover via Robin's experience and field of experts' advice. You can't help but like McGraw, her sincerity seeps through the pores of the pages. After losing her mother to a massive heart attack, McGraw stepped onto her vanity stool to share the message we needed to hear--taking care of yourself should be your first priority. Not doing so can (as in the case of her mother) be the death of you. Professionals in nutrition, skin care, compound pharmaceuticals, gynecology, alternative internal medicine, psychology, makeup, fashion, and hair color are quoted in this beauty bible. Chapters include Robin's recipes for better health and beauty, called Robin's Rx, as well as a question- and-answer section from her collection of experts. Although I found this book entertaining, I felt it lacked depth. The book's chapter on hormones fell short in providing information for a major sector of women, women in surgical menopause. McGraw's endorsement of bio-identical hormone replacement, however, was a timely one and falls on the high heels of the national media's attention to the subject. She combats the notion that the change from babe to banshee is an inevitable one. Robin asserts natural hormone replacement, and sleeping naked, can leave the pharmaceutical companies sweating alone. The chapter on Faith, at just 4 ? pages, read like an afterthought. I would have enjoyed reading how McGraw's relationship with Christ was shared with those in her makeover chair. After all, a life with Him is truly age defying, it's eternal. What's Age Got To Do With It blows out the myth that the number of candles on your cake could mean you're old. But don't eat the cake. Robin says sugar causes wrinkles. New York Times Best Selling Author, Robin McGraw's newest book, What's Age Got To Do With IT hit book stores earlier this year packed with her own secrets for living her healthiest and happiest life, and at age 55, she is doing just that. The emphasis that Robin makes to women is the importance of taking care of YOU first. I couldn't agree with Robin more on this. I believe women know this, but seldom are they practicing it. Robin's passion for health came as a result of experiencing the loss of her own mother at the young age of fifty-eight to a massive heart attack. She believes her premature death was due to a lack of self-care. Since the tragic death of her mother, Robin vowed to take charge of her own health and to not allow self-neglect. Robin began her mission to make sure that she lives her healthiest and happiest life possible, which she outlines in nine chapters. What's Age Got To Do With IT is loaded with health, fitness, recipes, beauty, and hormone advice from many top experts in the field. A lot of what she shares is similar to what we've read in other resources, but it's nice to see someone that is walking it. Reading "how to" articles are great, but what's more powerful is learning from someone that is showing evidence of truly living their healthiest and happiest life. I believe Chapter 5: What's Hormone Got to Do with It is very informative, especially for older women who were drawn to this book because they saw age 55 on the cover. The subject on Hormone Replacement Therapy has been a controversial one and can be confusing and overwhelming for many. While Robin shares her own journey with menopause and chose bio-identical hormones, she is well aware of the controversy and emphasizes that this is what worked for her. She encourages women going through menopause to work with their doctors, do research, and ask a lot of questions because women know their body. I love Robin McGraw's passion health and I believe it's never too early, nor late to make changes that will help you to start living your healthiest and happiest life possible. This book will greatly benefit anyone at any age; therefore, the title, What's Age Got To Do With IT is very appropriate!